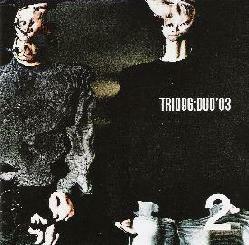 Trio96 - "Quartet 1999" / "Duo 2003"
Trio96 are a Japanese progressive jazz rock band that alternatively switches between being a duo and a quartet. Yes... the name says Trio but they only formed as a trio but never actually recorded as a trio but they left the original name. 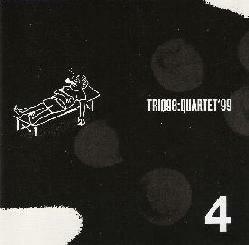 Let's start with the Quartet 99' CD. The opening track, "Nana (up)" is just killer. Incredible interplay between the musicians and some great guitar work as well. "JB" focuses more on the drums and sax at the beginning but then explores some other textures until about 4 minutes when the guitarist takes over. This track features a bit of Frank Zappa style soling but with a completely different guitar sound. "5 Beats" begins with a guitar line that reminds me of King Crimson meets Soft Machine style stuff and the way the sax is played as well. "9 Beats" is next and begins in a similar way to "5 beats", but then becomes much more chaotic and frantic. "Hayai Kyoku" ends the CD and has some of the more melodic sax playing on the CD. The band are great players and there is great consistency in the drum and bass playing leaving a lot of room for the guitar and sax players to be adventurous and show off their chops. Great stuff! Ok... what about the DUO??? The CD begins with the 9 minute "Left Handed Rotation". Virtual guitar and drums are mixed in with the real thing to give this CD a much more experimental feel. King Crimson with Allan Holdsworth on guitar is what it sounds like to me at times. What a cool band. For live and demo recordings you can visit their web site below. For more information you can visit the Trio96 web site at: http://sound.jp/trio96.